St Clare died on this day in the year 1253 at the age of 59. The pope at the time, Innocent IV, had known her personally for many years, and had even come with his court to the church of San Damiano in Assisi, the first Franciscan women's house, which Clare had ruled over for many years, in order to be present for her funeral. The story is told that the Pope had such a high regard of her sanctity that he wished to canonize her immediately without process, and celebrate the Mass of a Holy Virgin in her honor, rather than a Requiem for her, but was prevented by the admonition of the Franciscan Master General that to do so would be a violation of the Church's tradition. Pope Innocent himself died the following year, and so it fell to his successor, Pope Alexander IV, to canonize her just over two years after her death, on the feast of the Assumption in 1255. Her feast day was originally assigned to the day after her death, and kept on that day until 1970, partly out of respect for the martyrs Ss Tiburtius and Susanna, whose feast occupies August 11, but also so that her feast could have both Vespers without conflicting with those of St Lawrence. In art, St Clare is often represented holding a monstrance with the Blessed Sacrament in it, an unusual attribute for any Saint who was not a priest. This custom arises from one of the great miracles which she performed. 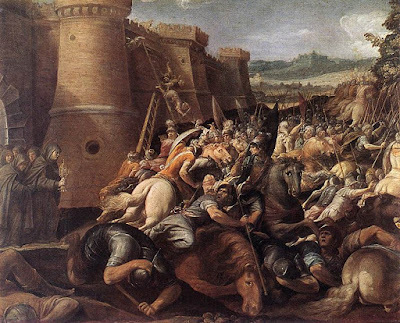 In the year 1234, the army of Frederick II, which counted a great many Saracens from Sicily in its number, were plundering the part of Umbria which includes Assisi. As the invaders sought to enter the convent at San Damiano, Clare took the ciborium from one of the chapels within the complex, and brought it to a window near the place where the soldiers had set a ladder against the walls in order to scale them. When she raised the Blessed Sacrament on high, the soldiers fell off the ladder and away from the wall as if dazzled, and the whole company of them fled. St Clare Defends the Walls of Assisi, by Giuseppe Cesari, (often called 'Cavaliere d'Arpino, 1586-1640), date uncertain; now in the Hermitage Museum in St Petersburg. 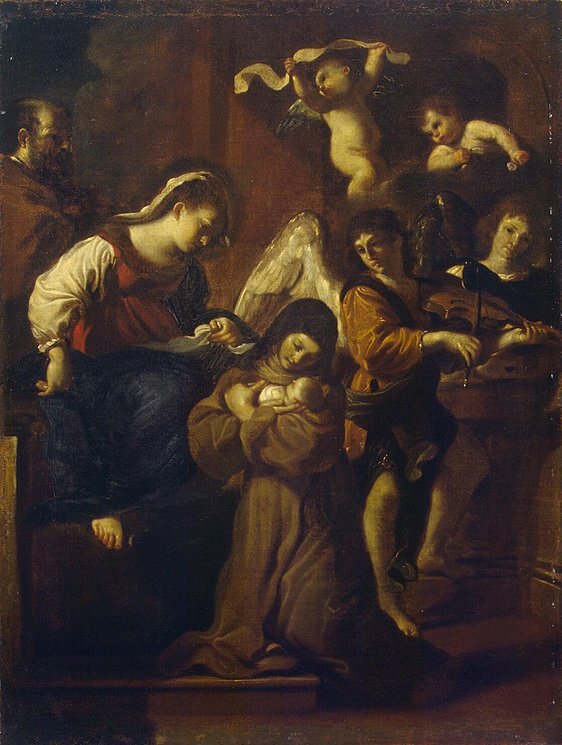 The Vision of St Clare (not the Midnight Mass vision), by Guercino, 1615-21, also from the Hermitage.